You’re cleaning up your diet and choosing to nourish your body with care but you may have moments of “missing” your old go-to treats. One of the coolest things about food right now is how creatively we can use healthy, life-giving ingredients to meet our needs – for health, fitness, nourishment, and fun! I have a super simple, delicious Portobello Margherita Pizza Recipe that you will want to make tonight! Portobello Mushrooms: This meaty, earthy delicacy is a good source of fiber and high in water that fills you up without adding excess calories. Portobello mushrooms are rich in minerals and the B vitamins, pantothenic acid, riboflavin, niacin, folate and thiamine, which are essential for a healthy metabolism and nervous system. Extra Virgin Olive Oil: Rich, high quality olive oil is a powerful antioxidant that aids in reducing inflammation, which is the driver of many chronic diseases such as heart disease, cancer, metabolic syndrome, diabetes, Alzheimer’s and arthritis. Omega-3 fatty acids, and vitamins E and K that support healthy digestion, cellular repair, and nervous system function are also abundant in olive oil. Tomatoes: Plump, juicy, sweet, and savory tomatoes are an excellent source vitamin C, biotin, molybdenum, and vitamin K. They are also a very good source of copper, potassium, manganese, dietary fiber, vitamin A, vitamin B6, folate, niacin, vitamin E, and phosphorus…Holy Loaded Tomato, Batman! Fresh Mozzarella: The power of this gooey melted cheese is bolstered by its nutrient rich profile. Niacin, riboflavin, thiamine, biotin and vitamin B6 keep skin, vision, and red blood cell production healthy, plus the fat-soluble vitamins A, D and E, are important for bone growth, absorption of calcium and protection of cell membranes. Basil: This aromatic herb from the mint family is an excellent source of vitamin K, manganese, and many other nutrients that support digestive health. Its anti-inflammatory and anti-bacterial properties provide powerful cellular protection. Get Friday Night, Pizza Night started! >>>Get your FREE 6 week meal plan here! Drizzle Portobello caps with olive oil and sprinkle with salt, garlic powder, and pepper (and optional red pepper flakes). 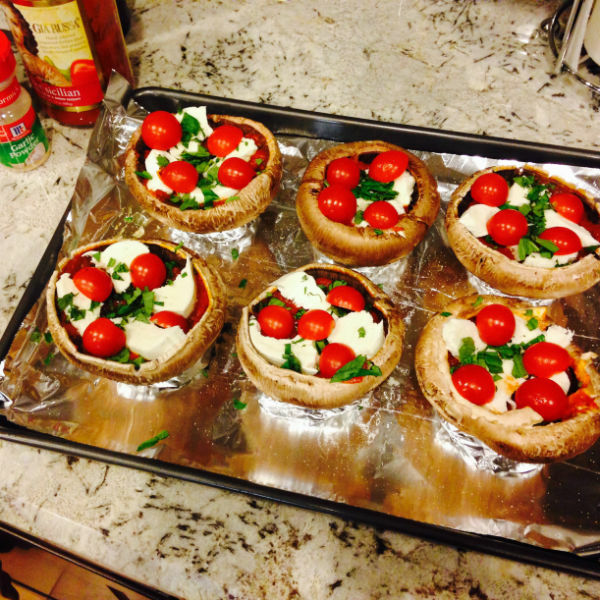 Place 2 slices mozzarella onto each mushroom cap then top with a few slices of tomato and a sprinkling of basil. Add a little Parmesan cheese. Finish with 2 more slices of mozzarella and remaining Parmesan to cover any open areas. 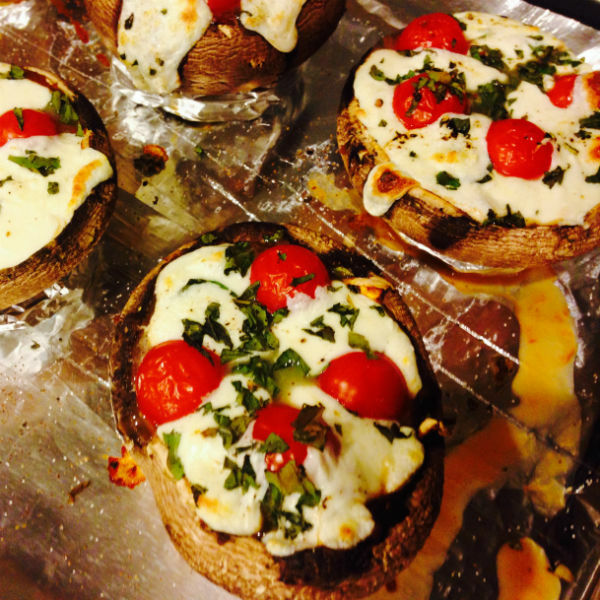 Bake at 375 for 20-25 minutes, until mushrooms have softened and cheese has melted. Garnish with basil and serve immediately. Enjoy! Avoid soggy bottoms by creating 4 small foil rings for the pizzas to sit on while baking… plus they’ll roast more evenly!